Support Exchange Server Pubic Store Database File(pub.edb): It includes the data shared between the multiple users. The Exchange EDB Mailbox to NSF Converter Software provides the extensive supports to corrupted exchange mailboxes and facilitates to convert that file to nsf format also. By default, software performs the quick scanning of exchange edb file. But if you want to use advanced mode then you have to check the box for the same. The Exchange to Lotus Notes Migration tool provides the flexibility to its users to export only selected or desired data from edb to nsf file format. For this user have to check or uncheck the respective mailbox items. By this option, it is possible to export only limited data to lotus notes to minimize the data redundancy. 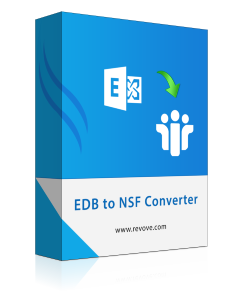 The EDB File to NSF Converter tool does not need live exchange server environment. It simply means that you are able to export the complete exchange edb database to lotus notes. But you have to make sure that Lotus notes are installed on the migration machine with dummy profile configured. Demo version of Software allows only loading, scanning and Preview of Exchange EDB Mailboxes. I have some corrupted exchange edb file but they are corrupted. Need to convert edb to nsf. Does software support corrupt edb files also? YesYou do not need to worry about corrupt exchange edb files. The software is technically strong to handle corruption issues of edb files and then export to nsf file format. Will the EDB Mailbox to NSF tool export calendars and contacts also? Yes, The software exports all the contacts and calendars and other exchange data as well to nsf file format speedily and efficient manner. Can I use this software to convert multiple mailboxes contained in edb file in batch? Yes Definitely, You can use software to convert single as well multiple mailboxes from edb file to nsf file format. What is the limitation of Free version of the software? The complete functionality of free version and license of the software are same but there is no export facility available in the demo version of the EDB to NSF Converter. Is Lotus notes prerequisite to export edb mailboxes to nsf file format? Yes, Lotus Notes application is needed for the successful conversion of exchange edb files to nsf file format. I am working as the system admin in large MNC. Currently, we were using the Exchange server for internal communication. But due to some technical issues and organizational need. We were planning to install Lotus notes, the difficulties that were faced by us was to use exchange data to lotus notes. But thanks to Exchange EDB to NSF Converter Software which helps us to effortlessly export exchange edb to lotus notes in a simplified manner. I was facing difficulties in the process to export corrupt exchange edb mailboxes to Lotus notes. But every time it results in the unknown error when following manual solution. How it become my hobby to search for the solution I don’t know. But by the god grace or my hardship, I came to know about Best EDB to NSF Converter. I used this software and amazed to see its proficiency in dealing with exchange error and corruption issues. Thanks a lot for developer team for such nice software.